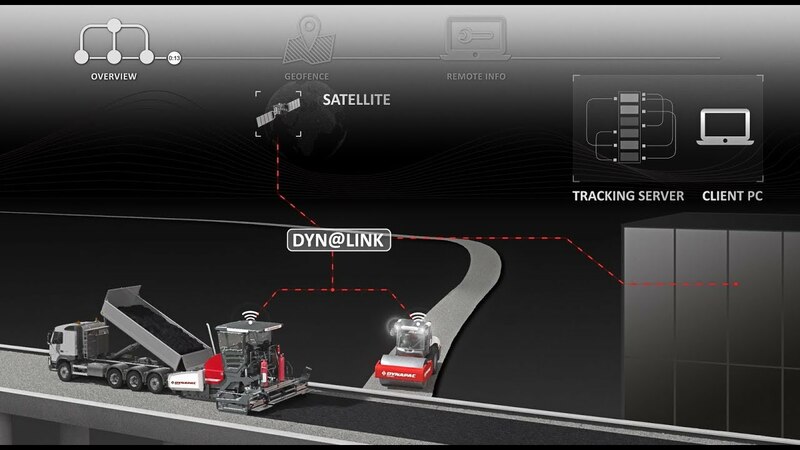 With the introduction of Dyn@Link, Dynapac Compaction Equipment provides customers a tool to monitor and control their machine fleet efficiently and conveniently. This intelligent telematics system offers many possibilities to optimize fleet usage, reduce maintenance cost and save time and money. Dyn@Link is available in three packages: Dyn@Link Standard, Dyn@Link Advanced and Dyn@Link Pro. The standard Dyn@Link package records the location of a customer’s equipment once every hour – both Dynapac made machines and equipment made by other manufacturers. The last known location of each machine is visible on a map in the Dyn@Link online portal. Geo-fences can be defined so that when a machine leaves a certain area, an alert is sent to a pre-defined e-mail address. Dyn@Link Advanced offers several interesting additional features supporting a full optimization of the machine park. It registers the equipment location every minute and logs many extra machine parameters like fuel consumption, engine load and coolant temperature. This allows customers to analyze fuel consumption per hour for instance, or compare the performance of different machines. Other things that help them get a grip on their operations are productivity analyses, based on operating and idle times. For example, you can see that a specific compactor is standing idle at a time when you would not expect it. With this information you can talk to the operators on the ground, find the cause, and come up with a solution. Without the data provided by Dyn@Link Advanced one would not have known about the problem in the first place. Dyn@Link Pro is the most extensive package offered and especially useful for the most advanced equipment like asphalt rollers, pavers and planers. On top of what Dyn@Link Advanced offers, it includes paving parameters like screed width and layer thickness values, all linked to the geographical location of the paver. Dyn@Link Pro also offers an integrated interface with BPO ASPHALT, a construction process optimization tool that allows contractors to optimize planning, execution and documentation of construction projects. Depending on personal preferences and requirements, the Dyn@Link online portal can be customized for measurement units, map settings and notification frequency. Besides the maintenance function, Dyn@Link Advanced and Pro, also features the possibility of tracking failures and warnings remotely, keeping downtime to a minimum. As an example, the Diesel Emission Fluid (DEF) level on Tier4f/StageIV machines can be tracked or a low oil level can be detected. All machine warnings are sent to the webpage or (if desired) to a registered email address. Download the latest brochure here. Monitor and manage your fleet of products from this portal.